Our society is characterized by a large number of techno-scientific controversies which governments and individuals have to face on legislative, cultural and moral level. For these themes there’s no monolithic truth, but multiple truths, often conflicting. Each controversy needs to be observed and described following different points of view, in order to allow different interpretations of the problem and different decisions. That’s what students did in their Final Studio, the last didactical experience in their path at the Communication Design Master Degree. 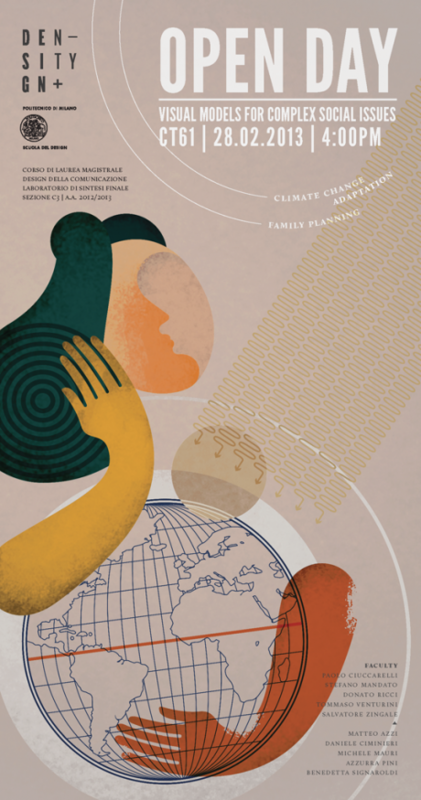 Reproductive Health and Climate Change Adaptation are the controversial domains explored. Reproductive health is a relevant issue for governments, from a healthcare, social and economic point of view. At the same time it’s part of our private sphere: how can social and individual needs find an agreement? Climate change has been for a long time, and still is, a gigantic controversy, especially for its causes. The scientific community has agreed by now that climate is changing towards a specific direction. Which actions can be undertaken by governments and individuals to adapt to climate change? To what extent are we supposed to drive the adaptation of endangered species? 3) motion graphics and tablet applications to share complex contents with some of the main stakeholders. You’re all invited, come and share the presentations with us! Will this work be shared online? This sounds fantastic and I’d love to see it. I just came across this and I thought I would share the data visualization we just did for WWF Spain regarding Climate Change Adaptation. It’s a visualization of projected living areas for fauna and flora species based on climatic projections for the next 90 years. Everything is focused on trying to implement adaptation measures, basically creating protected areas and ecological corridors.